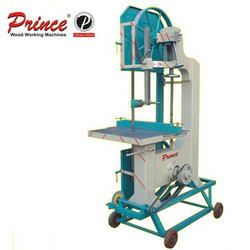 Prominent & Leading Manufacturer from Sirhind, we offer band saw c.i. body, band saw c.i. body 21", band saws j-540, band saws j-540 (e), bandsaw fully enclosed be21 and band saws j-518. 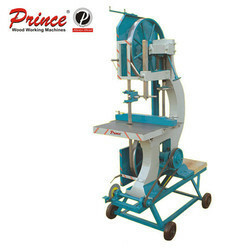 We offerBand Saw C.I. Bodyto our clients. 18" M/C 21" M/C 24" M/C 30"
1 Diameter Of Saw Wheel 18" 21" 24" 30"
2 Max. Cutting Capacity 11" 11" 19"
3 Throat Depth Capacity 12" 13.5" 23"
4 Table Size 20" X 21" 20" X 21" 26.5" X 25.5" 33" X 34"
5 Width Of Saw Wheel 1.3/4" 1.3/4" 2.5" 3"
6 Thickness Of Saw Wheel Flat 1/2" 1/2" 5/8" 1"
7 Table Height From Floor 34" 34" 27.5"
9 Saw Blade Length 10'7" 11'5" 14'5"
We offer Band Saw C.I. Bodyto our clients. 2 max. 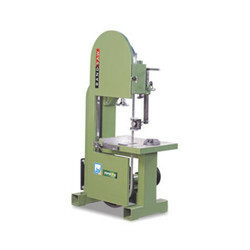 Cutting Capacity 11"
3 Throat Depth Capacity 12"
5 Width of Saw Wheel 1.3/4"
6 Thickness of Saw Wheel Flat 1/2"
7 Table Height From Floor 34"
9 Saw Blade Length 10'7"
Specially designed heavy duty body for better strength. Dynamically balanced CI broad wheels for smooth operations. 45 Degree table tilting for angular cutting. Diameter of saw wheels 305 / 12"
Throat depth 280 / 11"
Max Cutting Capacity 150 / 6"
Work table size 380 x 380 / 15" x 15"
Width of saw wheels 38 / 11/2"
Blade Length 2550 / 100"
Specially designed heavy duty CI body for better strength. Dynamically balanced CI broad wheels for smooth opration. 45 Degree table tilting for angular cutting. Diameter of saw wheels 305 / 12" 610/ 24"
Throat depth 280 / 11" 585 / 23"
Max Cutting Capacity 150 / 6" 355 / 14"
Work table size 355 x 380 / 14" x 15" 710 x 760 / 28" x 30"
Width of saw wheels 38 / 1 1/2" 70 / 2.75"
Blade Length 2285 / 90" 4290 / 169"
Grinding Attachment for Sharping of Band Saw Blade. Approx. Weight of Individual Machine 250 Kg. 300 Kg. Dynamically balanced CI broad for smooth opration. Diameter of saw wheels 610 / 24"
Throat depth 510 / 20"
Max Cutting Capacity 405 / 16"
Work table size 685 x 655 / 27" x 26"
Width of saw wheels 70 / 2.75"
Blade Length 4390 / 173"
Band Saw Pipe Body Wood Working Machines 18"
We provide Band Saw Pipe Body Machines to our clients. 1 Diameter Of Saw Wheel 21" 24"
2 Max. 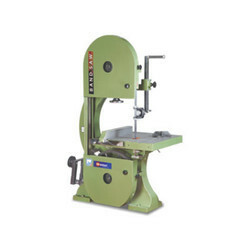 Cutting Capacity 12" 19"
3 Throat Depth Capacity 20" 23"
4 Table Size 24" X 24" 27" X 27"
5 Width Of Saw Wheel 2" 2.5"
6 Thickness Of Saw Wheel Flat 5/8" 3/4"
7 Table Height From Floor 34" 27.5"
9 Saw Blade Length 12'3" 14'5"